"As a member of the St. Benedict at Auburndale student body and out of respect for my own personal integrity, I pledge that I have neither given nor received any unauthorized help on this assignment. I further pledge that I will not tolerate any type of academic dishonesty." The St. Benedict at Auburndale Honor Code is aimed at preserving campus integrity. 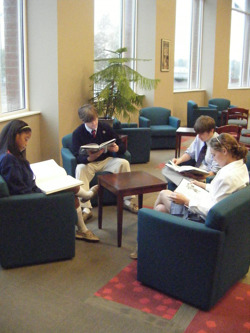 The purpose of the Honor Council is to foster a spirit of honor at St. Benedict; to provide continuing education to the St. Benedict community regarding the nature of personal honor; and to investigate and to act upon cases of dishonesty on the part of students in connection with academic life. The Honor Council primarily investigates instances of plagiarism, classroom cheating, lying and stealing. Faculty and students are expected to report to the Council any violations of the Honor Code. The Honor Council considers the case and makes a recommendation according to the guidelines of the Honor Council Constitution. Through the Honor Council, St. Benedict students make a unique commitment to truth and honor rarely valued in society today. Through the courage shown in adhering to the Honor Code, students promote honor among all members of the community and encourage one another to commit to excellence and integrity. Taking a stand makes us different, and we are proud to make a difference.